A tramway was constructed and ran from Hundall colliery via Glasshouse colliery via West Staveley colliery to Whittington station to transport coal from the collieries and onto the railway at West Staveley colliery for transport. Another tramway ran parallel to this from Glasshouse colliery to the station or the steel works. Shown on O.S. Maps circa 1880. There were several companies involved in the operation of the collieries and may have used more than one name during operation as did the collieries. This makes identifying individual owners to collieries difficult. By the 1896 list of coal mines it appears that this area is nearly all worked out, however by the first decade of the twentieth century several small mines have re-emerged, some in areas of previous operations. The area covered by Glasshouse colliery has at least 24 old shafts in 1880 this would indicate to me that the area was predominantly working ironstone, there are several different types of ironstone nodules to be found in the area. West Staveley colliery having at least five old shafts. Whittington Colliery was registered pursuant to the Joint Stock Companies Act 1856/7 with a capital of £60,000. The directors of the company being John Brown. Henry Rangeley. H. Chilton. W. Tuxford. F.R. Pierce. Derbyshire Times 20th November 1858. Whittington Freehold Colliery Company LTD was to be registered under the company’s act of 1862 at a capital rate of £135,000, which was 13,500 shares at £10 each. 25th July 1863. Whittington & Sheepbridge Colliery Co. Ltd. 1874 for the supply of coal and bricks from Broom House colliery at Old Whittington. Thomas Shipley Manager. The Silkstone/Whittington colliery at Broom House had now recommenced working and was able to supply coal to the area. 8th December 1883. Silkstone colliery Old Whittington formerly known as Broom House colliery recommenced working by 5th January 1884.Hundall & New Whittington Collieries plant and equipment are put up for sale on November 1st 1887. The colliery or collieries all appear to be closed before 1896. Derbyshire Times. October 8th. 1887. Important Sale on November 1st. Hundall and New Whittington Collieries. John Turner and Son. have been honoured with the instructions from the Hundall Colliery Co. to prepare for sale the whole of the valuable colliery plant comprising viz: seven winding pumping engines, one six wheel locomotive engine, headstocks etc. two Lancashire and two G.G. end boilers, 4,000 yards of railway rails, 300 pit tubs, wire ropes, contents of blacksmith shop. Tristrian Taylor and Thomas Flynn colliers working at Pierces colliery Old Whittington were convicted of leaving their employment without giving the customary 28 days notice. They were ordered to pay 12/6d expenses and return to work. Whittington & Sheepbridge Colliery Co. Ltd. 1874 for the supply of coal and bricks from Broom House colliery at Old Whittington. Thomas Shipley Manager. The Silkstone/Whittington colliery at Broom House had now recommenced working and was able to supply coal to the area. 8th December 1883. Silkstone colliery Old Whittington formerly known as Broom House colliery recommenced working by 5th January 1884. Hundall & New Whittington Collieries plant and equipment are put up for sale on November 1st 1887. The colliery or collieries all appear to be closed before 1896. 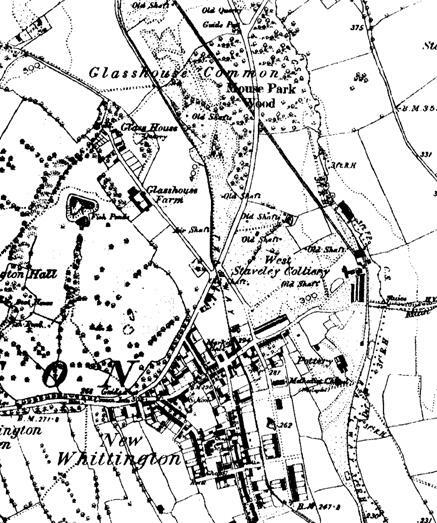 West Staveley Colliery at New Whittington is worked out by 1880. The colliery is reported as being flooded in January 1863 and temporarily not working. Also in 1863 the old colliery stock is sold off at auction and the colliery revamped. Railway coal wagons belonging to the colliery of 36 ton capacity are put up for auction at Whittington station sidings in February 1875. In 1864 the colliery is reworked with new shaft sinking. West Staveley Colliery. Owned by Bainbridge & Company. To be let the getting of ironstone from the Whittington Estate. Apply to the above colliery at Whittington. We believe there are no police cases to record this week from this colliery owing to the pit being drowned out. There was an explosion at this colliery last July. To let the sinking of a new coal pit at West Staveley. Specifications may be seen at the colliery office New Whittington. Marrs Whittington Colliery. 1854. 1862. Glasshouse colliery. Sale Mon July 3 1893 all of the colliery plant and equipment. Forge Colliery Whittington 1880 owned and operated by Knowles & Company. 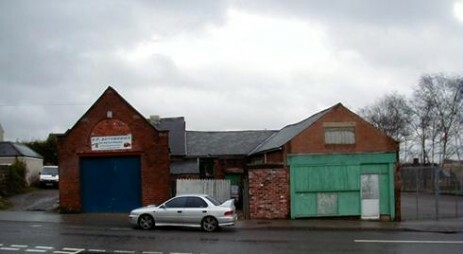 Brushes colliery owned by John Cropper in 1880.